Depressions and anticyclones are the two different pressure systems in the UK that affects the weather. An area of low atmospheric pressure forms the condition of depression. The rising air in the low pressure area forms clouds and lead to rainfall. Depression usually move towards east in the UK and bring changes in the weather. 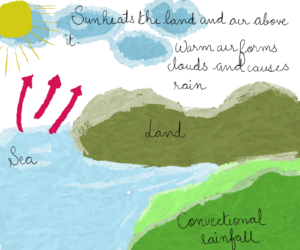 Look at the diagram below which shows how warm and cold fronts changes the weather of UK as these move eastwards. An area of high pressure forms when cool air moves downwards. Anticyclones move in clockwise direction. Anticyclones are associated with clear weather and sunny days. In summer, anticyclones bring warm and sunny days while in winters they cause fog and haze. On an average, one out of three days is rainy day in UK. West of the UK receives most rainfall while eastern area is relatively dry. The winds prevailing in the southwest brings moisture from the Atlantic ocean. 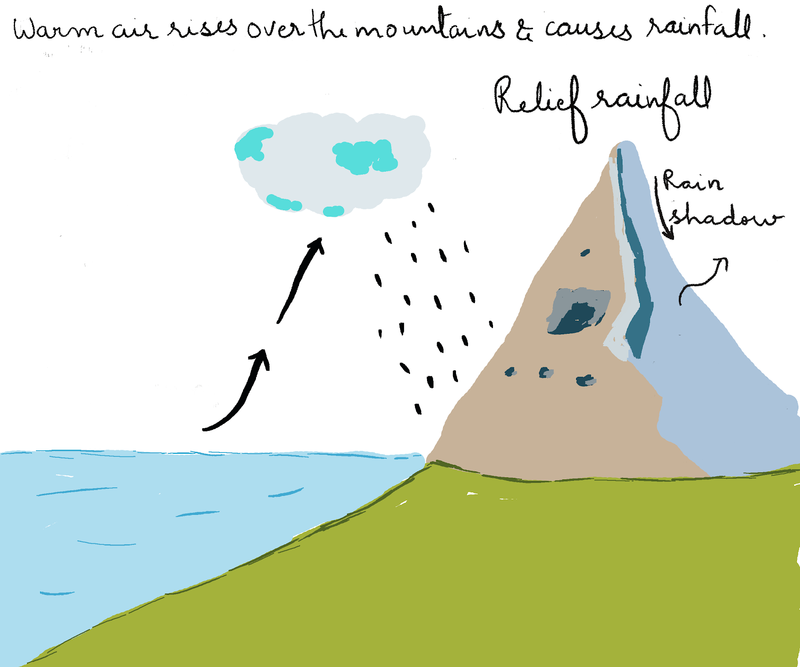 There are three types of rainfall that you can witness in UK. 1. 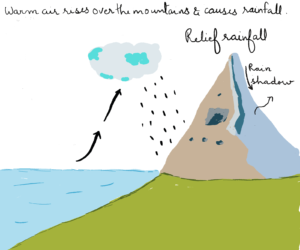 Relief – Rainfall which occurs due to rising of warm and moist air from the Atlantic ocean over the mountains. The warm air makes clouds and brings rain. Again after the air passes over the mountain it starts descending and warms. This forms dry conditions and is known as Rain Shadow. 2. Convectional Rainfall – The heating of land causes warm air from land to rise. In UK, this phenomenon is seen during summers. The pockets of rising air are called convection currents. The warm air cools and form clouds when it reaches upper atmospheric layer. The clouds can as big as cumulonimbus clouds which can lead to heavy rainfall and thunderstorms. Frontal Rainfall – Warm and cold front coming from the different directions causes heavy rainfall when warm air rises above the cold air. 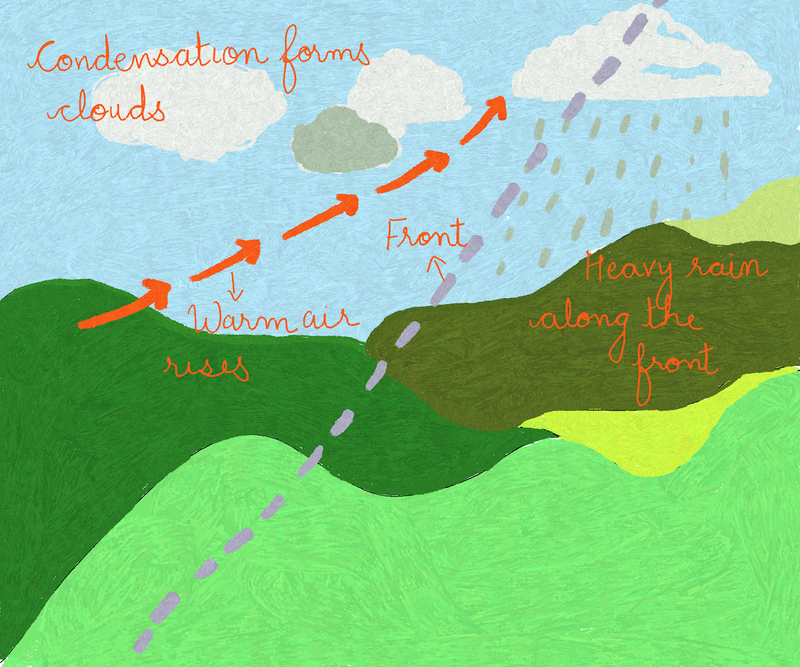 The rainfall is due to formation of clouds which occurs due to cooling of warm air. You might be imagining that the weather in the United Kingdom is not an extreme force, but there are actually a lot of weather hazards here. Some of them definitely affect us more than others, but you might have been exposed to a weather hazard in the past and simply not realised. When heat waves hit parts of the United Kingdom, they usually strike hard and fast. They usually last for prolonged periods of time, but we are not very well equipped for dealing with them. As heat waves progress, it becomes quite normal to hear about people losing their lives because of heat exhaustion. Pre-existing breathing conditions are also made worse because of the way that heat affects the levels of pollution that are present. Naturally, the heat can also cause roads to melt and rails to buckle. This affects transportation networks in the United Kingdom and can have a knock on effect on the economy. A drought can be characterised by a lack of precipitation. This means that it rarely rains or snows. Unfortunately, droughts in the United Kingdom can be quite severe and they can have a knock on effect on our water supplies. You have probably already heard about the hosepipe bans that are present in certain parts of the United Kingdom during droughts. These methods, and similar methods, are brought in to try and conserve water. Unfortunately, strong gales can also cause a lot of damage in the United Kingdom. Yet, they are quite a common occurrence that we are all familiar with. When winds are strong, they can begin to damage structures, damage transport links and even uproot trees that could potentially injure people. Experiencing a heat wave might sound horrible, but too much rain is just as treacherous. If the rain falls quickly, then flooding is a real risk. Flooding could damage domestic and commercial structures. It could also result in people drowning if they are caught in the water. If commercial properties are damaged, then businesses might have to close. This could have a knock on effect on the economy. Thunderstorms can be beautiful, but they can also be dangerous. They are usually characterised by rain, lightning and thunder that could hand in hand with strong gales. If lightning strikes, then it could cause fires, damage structures and even cause harm to human life. Have you ever witnessed someone driving during a hailstorm? It can be a scary sight. Driving becomes dangerous when hailstones start to fall and the hailstones can cause structural damage and damage to agriculture. Winter in the United Kingdom always seems to be relatively long and drawn out. Most of us will have slipped on snow and ice before, and it is easy to see how they can both cause injuries and deaths. In Winter, a lot of schools are forced to close because of the adverse weather conditions. Weather in the United Kingdom is quickly becoming more and more extreme. Over the past decade, we have witnessed everything from the coldest year in more than one hundred years to most of the rainfall records that had previously been set being broken. It is also commonplace for severe flooding to occur.